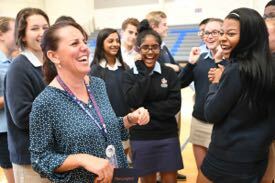 Tami Lunsford, who earned her Master’s degree at William & Mary’s Virginia Institute of Marine Science in 2002, has been named Delaware’s first winner of a Milken Educator Award for her success in teaching high school science at Newark Charter High School. Mike Milken, Foundation president and co-founder, surprised Lunsford with the Award in front of a visibly excited student body. He and Delaware's Associate Secretary of Education Angeline Rivello cited the consistent success of Lunsford‘s students and her many contributions to the school. Lunsford describes receiving the Award as “overwhelming and amazing,” and credits her graduate experience as key to her decision to pursue a career in the classroom. Lunsford began at Newark Charter in 2013, helping to expand the middle school into a National Blue Ribbon high school. 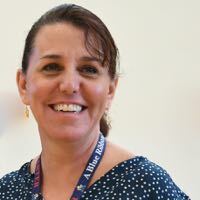 She helped shape the school's science curriculum and was appointed its Faculty Team Leader to interact with administrators, coach new teachers, and plan interdisciplinary efforts. For her Advanced Placement (AP) courses in biology and marine science, Lunsford uses inquiry-based investigations, project-based learning, and science competitions as key instructional practices. She also builds skills to help students become proficient in collaboration, problem solving, and social responsibility. Lunsford takes every opportunity to ensure that learning is an adventure. During one project, her students learned about sustainability and marine pollution as they transformed plastic bags into more than 5,000 sleeping mats for local homeless shelters. Her students also travel annually to Cape Henlopen for horseshoe-crab mating season and to the Bermuda Institute of Ocean Sciences every other year. They earn among the highest AP Biology scores in the state, with a 92% pass rate last year. Lunsford is also committed to extending her students' education beyond the classroom. She helped the student-led Marine Science, Environmental, and Feminist clubs organize a visit from U.S. Senator Tom Carper to voice their concerns about national environmental policy; the students were then invited to Washington, D.C., for a legislative hearing on protecting the oceans. 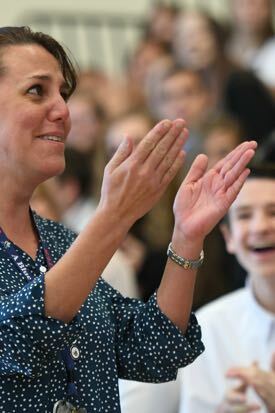 She also coached the Marine Science Club to an eighth-place finish in the National Ocean Sciences Bowl and helped students organize a local Science March on Earth Day, an effort that landed students an interview on National Public Radio. Lunsford is also a leader in the larger science-education community. She is a past president of both the National Marine Educators Association and its regional chapter, the Mid-Atlantic Marine Education Association, in which many VIMS educators are active. In 2015, MAMEA honored Lunsford with its Classroom Teacher of the Year award. She also coordinates internships for Marine Advanced Technology, partnering with organizations like the New England Aquarium to help teachers integrate marine science units into curricula.